There was a slight pause in Bertie and Croc’s adventure story from their visit to Newquay and the Eden Project while they got all excited about Christmas. We are going to resume the story here. Bertie and Croc hope you like it! Bertie and Croc were quite relieved when they saw that they weren’t heading up towards the zip line but they were making their way down the winding path deeper into the flowers and trees. They were placed down on a small, wooden bench. Bertie hopped out of the camera bag almost instantly. Croc took a little more persuasion as usual. He was quite comfy after all. They looked around. Where they had paused to take a break was covered in wildflowers. Bertie pointed out the drooping sunflowers and commented that they weren’t as big as their sunflowers at home. Croc, however, was distracted. His sensitive crocodile ears had picked up an annoying and constant buzzing noise in the background. He was finding it quite difficult to tune out. Added to that his crocodile senses were picking up on something rather unpleasant. Eventually he had to shush the excitable Bertie and ask him if he could hear the buzzing too. “Oh, now you mention it….”said Bertie, tipping his head to one side to listen more carefully. They made their way along the bench but the buzzing noise only got louder. “Buuuuzzzzzz off” It seemed to be saying. “Buzzzzzzzz off. My floooowers” Bertie looked up in shock and came face to face with the biggest bee he had ever seen. And believe me, Bertie had seen some BIG bees on his travels. They had always been quite friendly but this one, well, eek! Croc’s crocodile senses were going into over drive and he grabbed the shocked Bertie and began dragging him back to the camera bag. The buzzing noise followed them. This bee seemed to be awfully protective about HIS flowers! As they climbed back into the camera bag the buzzing got quieter. If you held you breath, closed your eyes and listened really hard you could still hear it. “Phew!” said Croc sinking down into the depths of the bag. Both friends felt quite relieved when the bag began to sway gently again meaning they were on the move. Hopefully, moving away from the possessive bee. That thing would scare even me! Poor Bertie and Croc! I know, it is quite big and intimidating isn’t it? Especially when you are 4 inches tall!!! At least they were on a bench. It is an impressive (grumpy) sculpture. 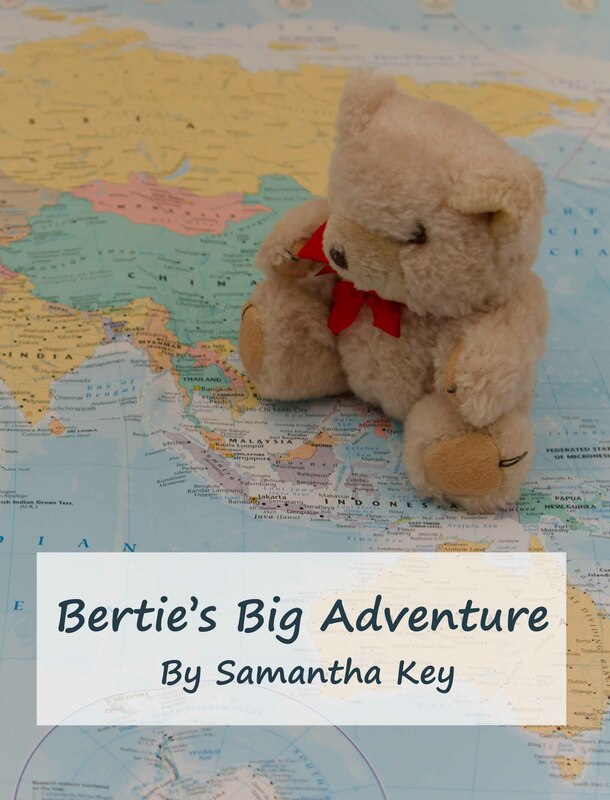 Bertie’s first book is now available!